Stylishly furnished and comfortable 2 bedroom apartment. Cape-x-ta-sea Apartment is attached to Cape-x-ta-sea Villa, it is completely self-contained with it's own private entrance, be warned there is a flight of stairs leading down to the apartment from the off street parking area. Once you enter the apartment you are met by an open plan lounge/dining/kitchen area. The lounge has ample seating, consisting of a plush corner couch unit and a couple of captain chairs. The TV has satellite channels and there is also a DVD player available. The antique wooden trunk that is used as a coffee table has an interesting story, you will notice scratch mark on the top, this was caused by a leopard trying to get to food that the 'original' owner had stored inside!! The kitchen is well equipped and has a counter dinning area. Leading on from the kitchen down the passage you come to the kids bedroom. This bedroom consists of 2 single beds, and sufficient cupboard storage. The bedding is top quality and cozy. The first bathroom has a bath, shower and toilet. Towels are provided. Just outside the bathroom is a laundry area with a front load washing machine. The Main bedroom is en-suite, it is furnished with a double bed, dressing table and loads of storage cupboards. The en-suite consists of a shower & toilet. Top quality linen are provided in all the bedrooms and bathrooms. The apartment has access to a paved patio area in a natural garden. The indigenous garden attracts many birds and it is very special to wake up to the sounds of birds chirping. A sensational quality of this home is its view of False Bay, it is breath taking. Whales, dolphins, seals and various fish species are easily seen from this beautiful vantage point. The Bay is constantly busy with yachts, Naval vessels, fishing boats and different water sports, it is interesting and enjoyable to sit and watch. The owner of the house is Benita Lenard, but the property is managed by Michelle Ubsdell. Benita bought the house in 2013, as it is an ideal family home for their annual visits. The Lenard family have lived abroad for many years and are currently living in Abu Dhabi. They enjoy travelling, but their hearts remain in Cape Town and they enjoy the convenience of their house in Fish Hoek. This home is well planned and comfortable. 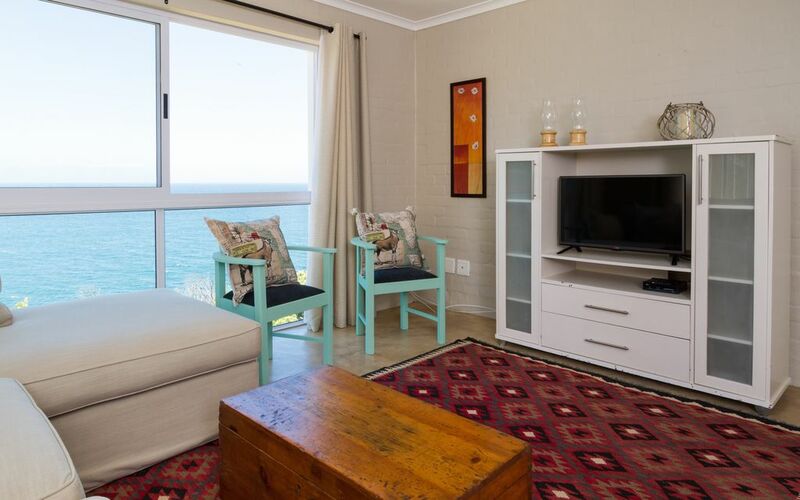 It is conveniently positioned in Sunny Cove a quaint nook on the outskirts of Fish Hoek. Sunny Cove train station is a stones throw away from the house, a few hundred meters down the road & then down a flight of stairs, cross the Main road and you at the train station and the beach. Fish Hoek is a friendly town situated on the Cape Peninsula, it hosts shops, restaurants and pubs. There are many water sport opportunities, two golf courses 10 minutes from the house, and the surrounding mountains offer many other out door activities, that may be enjoyed by residents and tourists alike. Fish Hoek has a safe family friendly beach, but remember the South African sun is harsh so suncream and hats are advisable to protect you & your family. First & foremost the best features of Cape-x-ta-sea are the views. The panoramic views are unobstructed and you are able to see right across False Bay. The morning sunrises are absolutely beautiful and in the evenings the glittering lights of the neighbouring towns is magical. The surrounding mountains at the rear of the house offer a unique opportunity to guest, they are able to use the hiking paths and enjoy the wonderful 'great outdoors' this beautiful part of the Cape has to offer, on foot or with mountain bikes. Nearest tennis courts in Fish Hoek village. Clovelly Golf Club is the closest, and Simonstown Golf Club is 15 minutes away. The mountains close by offer guest a unique option to hike or mountain bike. There are numerous scenic drives around the area, the most popular being Chapmans Peak and then the coastal drive to Cape Point. The Southern Peninsula is well geared for tourist with many varied restaurants, pubs and weekly food markets. Cape Point Vineyard offers offers a stunning setting where tourist can relax and soak up the views while sipping on chilled locally made wine. The surrounding area is a haven for water sports and events, most days from Cape-x-ta-sea you will see kayakers, surfers and divers enjoying False Bay. Kalk Bay is a neighbouring town that offers a quaint, interesting working harbour, where fishing boats come & go daily. You will also find charming craft & antique shops. Simonstown is in the direction of Cape Point and this small Naval town is steeped in history. There are also many restaurants. You may book 'whale watching' cruises and scuba dives here as well. Very nice apartment with super views. Nice kitchen and comfortable sitting area. Great spot to explore south Cape. Spacious with breathtaking views over the bay! Beautifully furnished ,we wanted for nothing! Excellent situation as everything is literally on your doorstep! The apartment is self-catering, but thank you for bringing these basic requirements to our attention as it will certainly benefit future guests. It is unfortunate the House Management where unaware of your frustrations, and therefore where not given the opportunity to assist you & improve your stay. We stayed in the apartment of Cape Extacy during the Christmas holidays. Our family of 4 had loads of space in the very comfortable accommodation. The views from every window were stunning, in particular the bathroom with is the most senic I've ever seen!! The decor was contemporary and the apartment was very well equipped. The property is very well located in Fish Hoek and it was an easy walk to the beach and town. Overall it was a fantastic location to be based for a Cape Town holiday as we toured around from there. I would highly recommend this property. Also it was immaculate and well managed by the very helpful team. Thanks to them we had a very smooth and enjoyable holiday. Can't wait to return. It's true every room has a magical view of our active, beautiful bay, there's always some sea creatures, boats/yachts, kayaks or sun rises to watch & enjoy. I'm thrilled to hear your family had a comfortable stay. We look forward to your next visit. Great stay in real comfort! Gorgeous setting with incredible sea views. Large, spacious rooms. The beds were very comfortable. Not appropriate for guests that don't like stairs. We would stay there again for sure! Thank you I'm so pleased to hear you had a comfortable stay, yes the stairs do keep you fit, but the view is well worth it. We look forward to your next visit. a great escape from reality on your doorstep. Thank you Benita for out truly amazing stay at your beautiful home. We couldn't have asked for a better location to celebrate one of our dearest and closets friends hen party's. The entertainment area is spacious, comfortable with Panoramic views of the bay. The furnishing were new yet relaxed and made us feel at home. The indoor / outdoor pool was the cherry on the top. The bedrooms were large enough to accommodate all the girls plus there very large over night bags. One of the best moments was going to sleep with sound of the ocean and waking up to fresh smells of the sea air. We really felt like it was a holiday get away. We will definitely recommend your home away from home and we will definitely be back. Brilliant to hear, the proximity of Cape-x-ta-sea to the ocean is one of the homes best features. We look forward to your future visits.